We recently visited Bangkok, Thailand and are happy that we chose Novotel for our stay in the heart of the city. Standing 26 floors tall in the heart of Sukhumvit’s business and entertainment district, the hotel boasts the new face of Novotel brand across the world. The hotel’s modern design concept incorporates chic flare of Thainess into all of its elements, not to mention being one of the most environmentally friendly designed hotels in Bangkok. Along with the hotel’s full-service facilities, Novotel Bangkok Sukhumvit 20 is a stylish choice for all discerning travelers. Entering the hotel, guests will definitely feel the sense of arrival into Bangkok from its interior design, art pieces, room and restaurant decoration which is guaranteed to impress. This refreshing interior design reflects the local flare into the overall modern feel of the hotel. As we stepped out of our cab, there were smiling faces around to receive us. The staff greeted us warmly and directed us to the lounge. It was a very pleasant gesture. The check-in process was very smooth and highly professional. The stylishly designed gourmet bar at the lounge is definitely a beautiful place to hangout. Upon downloading the Accor Hotels app, a welcome will be offered at any counter of your choice – The infinity pool bar or the gourmet bar. As we checked into our room on the 19th floor, the eye-catchy view of the lively city held us captive. The window couch was a perfect place to keep watching the dinosaur park, the giant wheel, the sky train track, and the shiny tall buildings all around for a long long time. As we headed out to explore the places around, the staff helped us with the routes. The shuttle service provided to the nearby BTS station was really helpful. Novotel Bangkok Sukhumvit 20 offers 244 guestrooms and suites featuring stylish, contemporary designs. The architecture is inspired by arts and culture from all 4 regions of Thailand. The hotel offers great services for families and children with facilities starting with the room choices including family suites or family interconnecting rooms, kids club with games and activities to allow kids’ imagination to thrive and parents to relax, a kids pool, a special kids menu at food exchange. Located in Khlong Toei(in Sukhumvit), this hotel is 0.5 km from Dinosaur Planet and within 6 km of Siam Paragon Mall and Pratunam Market. Siam Square and MBK Center are also within 6 km. It is also less than 10 mins walk to Asok & Phrom Phong BTS/metro station which allows travelers the convenience of getting around Bangkok without any hassle & avoiding the unforgiving traffic jam. Here, moderate to plus hotels are complemented by a nightlife scene that thrives along one of the major commercial arteries of Bangkok. The mix is further enhanced by street stalls, international restaurants, antique shops, traditional stores, and large shopping complexes such as Sukhumvit Plaza, Times Square, Robinsons, and the up-market Emporium. The Skytrain offers speedy access along the thoroughfare. 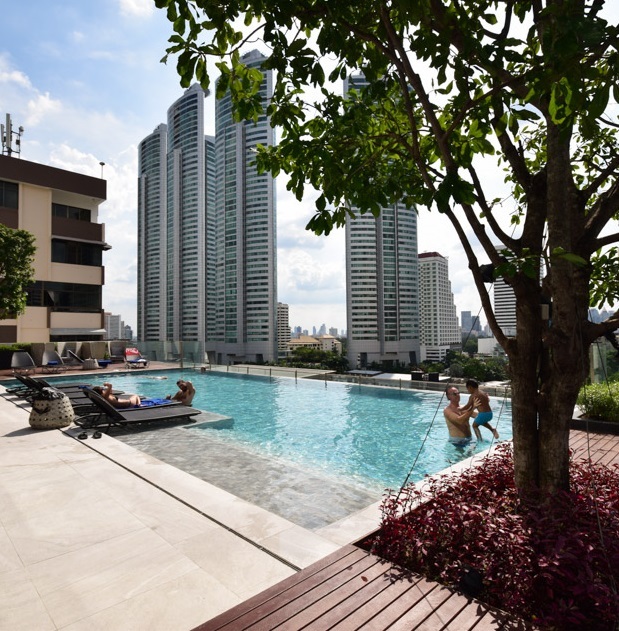 Overall the location of Novotel Bangkok on Sukhumvit is definitely their trump card which is ideal for tourists on a business, shopping, nightlife or food hunt trip in Bangkok. The rooms are spacious, contemporary in design and adaptable. Each Novotel room is truly a place for living, perfect for all your needs.The Superior room is contemporary design with a great ambiance with its wooden background & furniture fittings. All 244 rooms feature thoughtful touches like minibars, safety lockers, ironing unit, LCD TVs, smart electric control, bathrobes, and slippers, along with free WiFi and 24-hour room service. The bathroom has a separate shower area with rainfall showerheads, vanity & water closet with the high-quality Novotel bathroom amenities. The shower glass can be made transparent or covered with a raise-fall curtain controlled by a switch if you noticed in the photos. The feature makes the room look spacious. The dining/food exchange is where the hotel guests enjoy their daily buffet breakfast and meals. The breakfast offers a variety of quality selections from Western to Oriental cuisines. The restaurant is contemporary designed with the expansive view of Sukhumvit area & hotel lobby, an ideal place to enjoy your moments of Bangkok life while savoring the food. Buffet breakfast opens from 6.00am to 10.30am and offers a great selection of food. One of the highlights of the hotel is definitely the rooftop bar on the 26th floor that offers a spectacular view of Bangkok city skyline. There is a fitness centre equipped with most cardio machines and weight resistant equipment on the 9th floor. Sky on 20 : Sukhumvit’s newest Rooftop bar, located on the 26th floor to enjoy a 270-degree view of the Bangkok city skyline and lake Ratchada serving a full range of cocktails, wines and imported and craft beers, as well as modern Mexican cuisine. Pool bar : Sip and enjoy a cool drink or snack from the infinity pool bar and the sun lounge or poolside undercover dining area. Families can also enjoy a dedicated kids pool and a separate kids club. The impeccable services from the beginning to the end at Novotel Bangkok Sukhumvit 20 set it apart from others. Small thoughtful gestures enhance the guest experience, making everyone feel as a valued guest. The staff often smile & greet us, attentive to our needs, ensuring our stay was faultless & enjoyable. If you are looking for a rock solid service hotel for holiday, weekend staycation or business trip, Novotel Bangkok Sukhumvit 20 no doubt is one of the ideal choices. To find out more & book directly on their website: NovotelBangkokSukhumvit20 Or find them on Agoda and Tripadvisor. Disclaimer: Interlude Journey were invited as guests of Novotel Bangkok Sukhumvit 20 Hotel, but as always all opinions are our own. We absolutely loved it here and hope you do too! The Novotel looks fab! The pool and 3 bars/restaurants sound like great places to hang out and unwind from the city around you! Sounds like a great place to stay! I wish you would have talked more about your own stay to make it sound more personal. I would love to spend some time by that pool overlooking the city sipping a cocktail from the bar. Thanks for sharing! Looks like a comfortable and convenient hotel. How far would it be from the MTR station? Looks like a very convenient and comfortable place. How were the restaurants? How far it is from the metro station? I am not a fan of Novotel hotels but this one exceeds my common perception about this hotel chain. It looks really beautiful from your photos and good according to your review. I recently stayed at Novotel property near Hyderabad airport and I was not blown over by their facilities. This property seems to be much better. All the photos add to the beauty and being in the centre of everything also seems to be an added plus. Loved the interior and the ambiance very soothing and tranquil. The hotel sounds like a great family stay with amenities for kids like kids club with games and kids pool. We are surely gonna consider this on our visit. Wow this property looks amazing! Are there several Novotels in Bangkok? Back in 2014 we took a cooking class in Bangkok and a couple we were with stayed at Novotel and they had a disastrous experience. Doesn’t sound like the looks of this one! This hotel looks comfortable and convenient. I love the fact that it is in Sukhumvit, the heart of all the action in Bangkok. My favourite parts is the roof top pool. Thanks for mentioning the list of attractions around…very useful. The layout of your blog is beautifully presented! Really easy to find the information! The Novotel looks amazing- I stayed in the Sukhumvit area when I was there and it was definitely my favourite!